One of the weakest aspects of some pastoral ministries is conflict resolution. In fact, many of us are plagued with conflict situations, many of these sapping energy and vision from effective ministry. Most of us have not been trained very well in dealing with conflict. Sometimes we do a better job at creating conflict as a means of change, but we fail to be able to successfully resolve these situations and bring healing to our church dynamics. 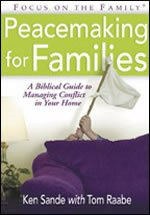 This book is a wonderful resource for learning how to manage conflict confidently and constructively. The authors appeal to Scripture throughout and explain very clearly the application of all the relevant verses to this subject. The contemporary stories and illustrations are good testimonies of what can happen as we attempt to resolve conflict God's way. Most of us have not been trained very well in dealing with conflict. The authors emphasizes that we as Christians must have a concern for God's commands and reputation instead of just looking at our human interests. We must see in Scripture that God cares very much about peace, and we should be modeling this character in all our relationships. We must take our faith seriously and trust that, in God's timing and sovereignty, many situations will resolve positively. They challenge us to ask ourselves often in times of conflict if this situation is "really worth fighting over." Before we allow a conflict to escalate, we must examine what part we have in this — by checking our thoughts, our words and our actions. How can I please and honor the Lord in this situation? How have I contributed to this conflict and what do I need to do? How can I help others to understand how they have contributed to this conflict? How can I demonstrate forgiveness and encourage a reasonable solution to this conflict? This resource is wholeheartedly recommended to all pastors. It is thorough treatment of this crucial subject. It should help many of us to more confidently and constructively deal with the conflict situations that are an inevitable and necessary part of pastoral ministry. was published by Focus on the Family / Tyndale in 1997. Have pastors today compromised the gospel and their callings to avoid hardship, criticism and involvement? Are they too comfortable in their isolated offices to mingle with their beloved as did the Great Shepherd? But Its Health That Counts! More than 100,000 churches in the United States have 50 attendees or less. That means that the average church will have fewer than 100 worshippers this Sunday. The survival of a church will be ensured by its health, not its size. You can't stop gossip from circulating, but you can take steps to protect your family from the damage.